The tissues sector has boomed over the last few years. With a move to more luxurious tissue paper and ultra absorbent paper towels the industry has been able to increase the tissue prices and create new brands to retain consumers. Add to this growing market in developing countries and a drive to innovate, and there are very positive signals for the future of tissues. 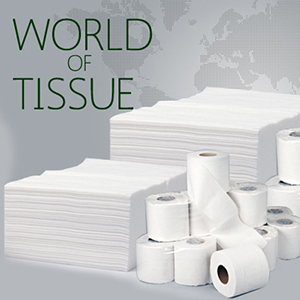 The tissue segment has become one of the most important segments of the paper industry in developed countries. It produces one of the most highly valued and appreciated, though not necessarily talked about, paper products. Tissue paper or simply tissue is a lightweight paper or, light crêpe paper. Tissue can be made both from virgin and recycled paper pulp. Tissue papers are the most common thing that we use in our daily life from cleaning, dusting, wrapping and personal use. As far as the history of tissue paper industry goes, although paper had been known as a wrapping and padding material in China since the 2nd century BC, the first use of toilet paper in human history dates back to the 6th century AD, in early medieval China. If we could travel back in time to 1391, we would encounter a Chinese emperor who demanded the first paper sheets sliced to be placed in his outhouse. The first “official” toilet paper was introduced in China measuring a whopping 2 ft X 3 ft each. An important move towards the production and distribution of modern toilet tissue paper came from a teacher in Philadelphia in 1907. Concerned about a mild cold epidemic in her classroom, she blamed it on the fact that all students used the same cloth towel. She proceeded to cut up paper into squares to be used by her class as individual towels, a revolutionary idea. Arthur Scott of Scott Paper Company heard about this teacher and decided he would try to sell the carload of paper. He perforated the thick paper into small towel-size sheets and sold them as disposable paper towels. Later he renamed the product Sani-Towel and sold them to hotels, restaurants, and railroad stations for use in public washrooms. In 1931, Scott introduced the first paper towel for the kitchen and created a whole new grocery category. He made perforated rolls of "towels" thirteen inches wide and eighteen inches long. That is how paper towels were born. It was to take many years, however, before they gained acceptance and replaced cloth towels for kitchen use. Tissue paper is produced on a paper machine that has a single large steam heated drying cylinder (yankee dryer) fitted with a hot air hood. The raw material is paper pulp. The yankee cylinder is sprayed with adhesives to make the paper stick. Creping is done by the yankee's “doctor blade” that is scraping the dry paper off the cylinder surface. The crinkle (creping) is controlled by the strength of the adhesive, geometry of the doctor blade, speed difference between the yankee and final section of the paper machine and paper pulp characteristics. The highest water absorbing applications are produced with a through air drying (TAD) process. These papers contain high amounts of NBSK and CTMP. This gives a bulky paper with high wet tensile strength and good water holding capacity. The TAD process uses about twice the energy compared with conventional drying of paper. Tissue paper has number of applications and they come in number of varieties such as hygienic tissues, facial tissues, paper towels, wrapping tissues, toilet tissues, table napkins etc. Facial tissue has been used for centuries in Japan, in the form of washi (??) or Japanese tissue, as described in this 17th-century European account of the voyage of Hasekura Tsunenaga. In 1924 facial tissue as it is known today was first introduced by Kimberly-Clark as Kleenex. It was invented as a means to remove cold cream. Kimberly-Clark also introduced pop-up, colored, printed, pocket, and 3-ply facial tissues. Paper towels are the second largest application for tissue paper in the consumer sector. This type of paper has usually a basis weight of 20 to 24 g/m2. Normally such paper towels are two-ply. This kind of tissue can be made from 100% chemical pulp to 100% recycled fibre or a combination of the two. Normally, some long fibre chemical pulp is included to improve strength. In 1951, William E. Corbin, Henry Chase (scientist), and Harold Titus began experimenting with paper towels in the Research and Development building of the Brown Company in Berlin, New Hampshire. By 1922, Corbin perfected their product and began mass-producing it at the Cascade Mill on the Berlin/Gorham line. This product was called Nibroc Paper Towels (Corbin spelled backwards). In 1931, the Scott Paper Company of Philadelphia, Pennsylvania introduced their paper towel for kitchens. They are now the leader of the manufacture of paper towels. Wrapping tissue is a type of thin, translucent paper used for wrapping presents and cushioning fragile items. Table napkin, or face towel (also in Canada, the United Kingdom, Australia, New Zealand and South Africa: serviette) is a rectangle of cloth used at the table for wiping the mouth and fingers while eating. In the United Kingdom and Canada both terms, serviette and napkin, are used. In certain places, serviettes are those made of paper whereas napkins are made of cloth. Rolls of toilet paper have been available since the end of the 19th century. Today, more than 20 billion rolls of toilet tissue are used each year in Western Europe. Joseph Gayetty is widely credited with being the inventor of modern commercially available toilet paper in the United States. Gayetty's paper, first introduced in 1857, was available as late as the 1920s. Gayetty's Medicated Paper was sold in packages of flat sheets, watermarked with the inventor's name. Seth Wheeler of Albany, New York, obtained the earliest United States patents for toilet paper and dispensers, the types of which eventually were in common usage in that country, in 1883. Moist toilet paper was first introduced in the United Kingdom by Andrex in the 1990s and in the United States by Kimberly-Clark in 2001 (in lieu of bidets which are rare in those countries). With so many varieties available, tissue industry is growing leaps and bounds. Out of the world's estimated production of 21 million tonnes of tissue, Europe produces approximately 6 million tonnes tissue every year. The European tissue market is worth approximately 10 billion Euros annually and is growing at a rate of around 3%. The European market represents around 23% of the global market. In North America, people are consuming around three times as much tissue as in Europe. In Europe, the industry is represented by The European Tissue Symposium (ETS), a trade association. The members of ETS represent the majority of tissue paper producers throughout Europe and about 90% of total European tissue production. ETS was founded in 1971 and is based in Brussels since 1992. Finally, the paper tissue industry, along with the rest of the paper manufacturing sector, has worked hard to minimise its impact on the environment. Recovered fibres now represent some 46.5% of the paper industry’s raw materials. The industry relies heavily on biofuels (about 50% of its primary energy) and it is highly energy-efficient. EDANA, the trade body for the non-woven absorbent hygiene products industry (which includes products such as household wipes for use in the home) has reported annually on the industry’s environmental performance since 2005. The industry’s impact on the environment is in fact, relatively small. All in all, the tissue sector continues to be a growth industry worldwide, offering new opportunities for companies to expand. Recently, there has been a great deal of interest, in particular, in the use of recovered fibres to manufacture new tissue paper products. However, whether this is actually better for the environment than using new fibres is open to question.